Level 84 now. AMAZING build! Great work and thank you! I have one question...Is Point Blank really that good? The projectiles from molten burst are extremely short range, which means you have to be practically on top of someone to get any bonus damage...and more often than not you'll be hitting something for less damage while spinning around like a madman. I just don't see how it's a damage gain with such a short range spell. Molten burst seems to land practically right next to me. Yes Point Blank is that good. It does nothing for cyclone or the melee part of molten strike (if used), but the balls from Molten Burst and Molten Strike are counted as projectiles with a base range of 5-20 wich is the optimal distance for Point Blank. This skill node is a no brainer in terms of damage. I guess I'm still confused. How is 5-20 units optimal for Point blank? The "optimal distance" for point blank is as far as possible since the % more damage is based on the total distance of the skill, not just distance. For instance, any monster more than 10 units away is receiving LESS damage from molten burst than not taking the node at all. If you look at a units map of poe, 10 units is not very far at all, and creatures are getting hit from molten burst at that range all the time. I guess I'll take it and try it, but the math just doesn't seem like it's a "no brainer" to me, or very consistent. I'm almost lvl90 now with this builds in Abyss. It makes lots of fun to play this build! There are just 2 things i don't understand yet. 1) I'm insta dying on elemental reflect maps. I cyclone into the mobs and am dead. How do i prevent that? I thought elemental reflect is not an issue anymore? Having a lot of fun with the build so far ! But struggling a bit with resist. It's a decent dps boost, but I would prefer stacking life and resist here (even a bit of similar dps with ele dmg and/or atk speed). But I'm not sure about surviving reflect dmg without that one. Did you try to play without it maps guys ? Thanks ! 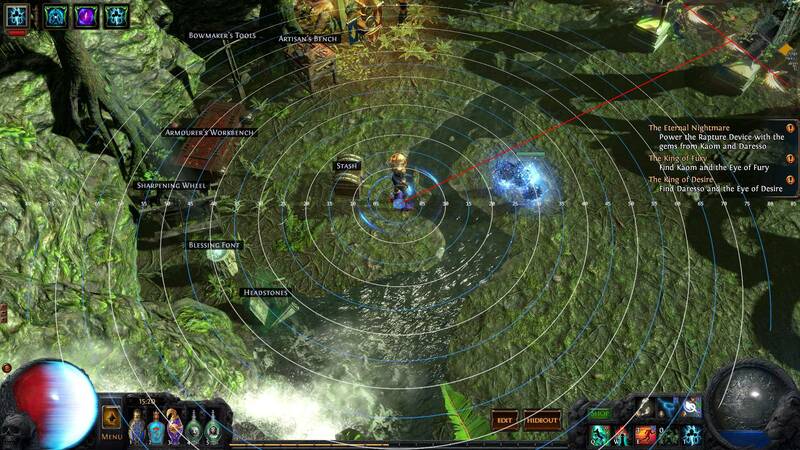 Sybil's Lament is no longer required if you are running maps that do not roll Elemental Reflect mod on it. This is because of the 3.1 changes to single elemental reflect rare mods in regular maps now does a projectile attack. However, elemental reflect map mod still works the same as before. Thanks for the tips/guide kira; that chest definitely seems insane for the cremation setup but it's sooo expensive. Will be awhile before I obtain one lol; my buddy told me it stacks with fire pen but I have not been able to confirm myself. I would believe they stack too because GGG is rather literal when it comes to wording (Elemental penetration and fire penetration are two different wording). is a keystone passive skill that scales the damage of projectile attacks with respect to the distance the projectile has traveled, dealing more damage initially then much less damage after covering a long distance. From above, you can see that your understanding of Point Blank is reversed. Point Blank does more damage when projectiles are closer to you and they deal less damage when they are further away from you. This is why Point Blank is perfect for Molten Burst as the balls will always land near you, enabling them to deal 50% more damage. Ans 1: Elemental reflect map mod still works as before. The changes to reflect is on single elemental reflect mod in regular maps. Re-roll elemental reflect when it shows up on your map. Ans 2: You use Vaal Lightning trap on boss. It will apply shock on them and you can take them down faster. You cast Enduring Cry just right before you engage a pack of mobs. It is especially useful when you are fighting Porcupines mobs. I'm having a lot of trouble with uber lab. I cannot consistently complete it. Majority of the time I'll get one shot by izaro but occasionally I'll die to traps in gauntlet. Any recommendations? I've got a bronns trying to 6 link it atm. Anybody know the order from most important to less one to use gemcutter prism to get the quality of gem up? Unlike the other gems which only affect their main gem, HoA actually affects both Molten Burst procs and Cyclone. This should probably be your first gem to upgrade unless someone can think of a better reason not to. Any point in pickin up the Hemo nodes for more survivability? T6 elder guardian and crit map mods kinda shreddin me. Thanks man! Btw those are my gear it prob should go the way u say it for gem quality upgrade :P Btw when u say Weapon Elemental Damage its the Elemental Damage With Attack Support gem right? Yes, it use to be called "Weapon elemental damage support" now its "ELemental Damage with Attack support". You should look to get flammability whenever possible in the build as well unless youre going for a more sturdier build with the elemental weakness but then don't forget youll need more INT in your build than the build normally runs(avg is like 110-115s vs 155s or so with Ele weakness iirc).